Product code: 2558 Categories: Sold Items, Sold Jewellery. What a magnificent and elegant aquamarine pendant that is highlighted with pearls and diamonds and has the most intricate work thanks to the platinum. 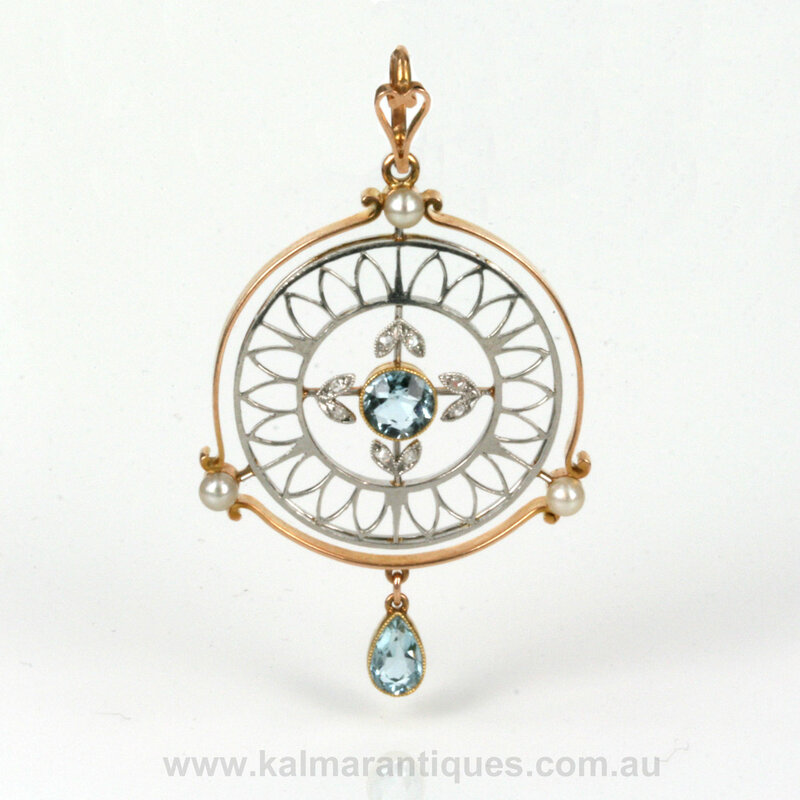 Typical of the work jewellers were producing in the early 1920’s, this pendant is all hand made in 18ct rose gold with the suspended aquamarine set in 18ct yellow gold and platinum in the centre. Platinum has the wonderful advantage over white gold as it can be drawn into a fine wire and still retain its strength. Both aquamarines are milgrain set which is the elegant crimping along the edge of the setting which is often seen in many Art Deco pieces. 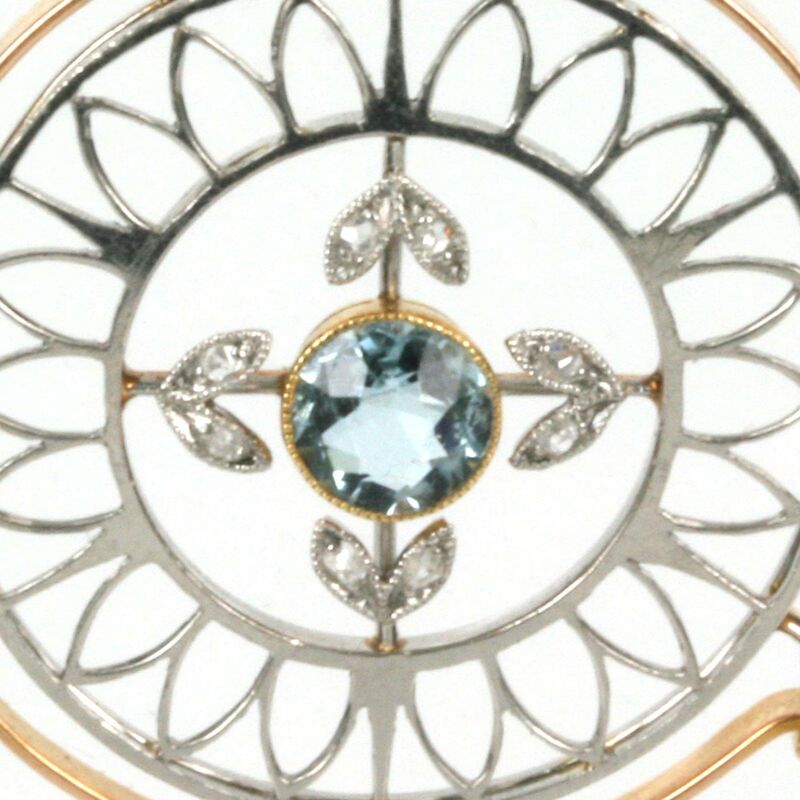 Surrounding the centre aquamarine are 8 diamonds that are again milgrain set. The three pearls set around the setting are so attractive and just add to the charm that this pendant has. 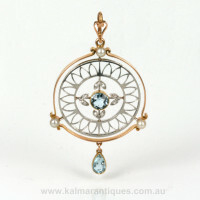 From left to right, the diameter of the pendant measures 26.8mm across and from the very top to the bottom of the lower aquamarine it measures 47.9mm in length. This Art Deco pendant looks so elegant especially on the neckline and has so much fine detail from the hand made work as well as all the charm that you get from the gemstones.